Nostalgia at 1911 Brasserie- Classic European restaurant at The Imperial orchestrated the launch of Piano club on Steinway to initiate extravagant live concerts with unique artists and mega performances each time, promoting the live music heritage of the hotel. 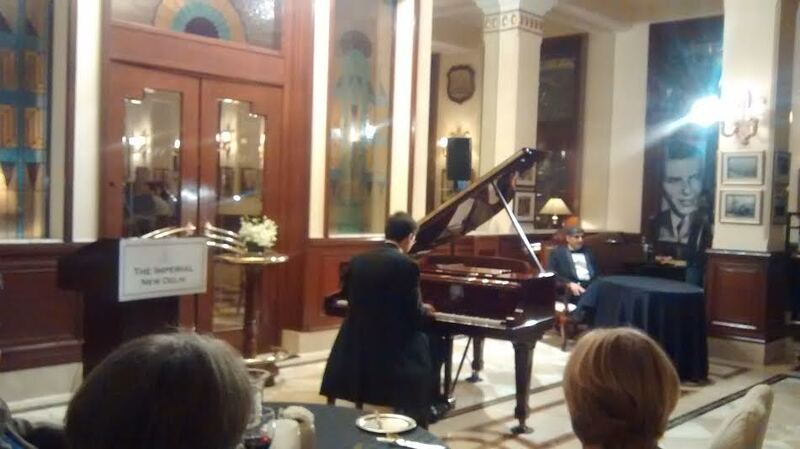 The evening commenced with an astounding experience filled with the notes of unmatched piano music, recited by the magical fingers of the undisputed Moroccan Hungarian Pianist Marouan Benabdallah in association with Hungarian Information and Cultural Centre. Marouan Benabdallah, the renowned concert Hungarian –Moroccan pianist enthralled the audience with his dynamic recitals and numerous sequences inspired the gathering, whilst he draw audiences into the very heart of the music, during his live performance for the evening. Vijay Wanchoo, Sr. Executive Vice President and GM expressed his views on the proud occasion: “Progressing towards luxe and unique live concerts on Steinway, post its launch at Nostalgia in 2013, this evening embarks our sojourn towards creating a Piano club which puts into form sit-down live concerts lending an ecstatic aura and matching the repertoire as well as the legacy of the hotel.” He further went on to thank the Hungarian Information and Cultural centre which partnered with this event. Posted on March 11, 2014 by AparnaPosted in Hotel, Luxury, News, UncategorizedTagged decor, design, Food and Beverage, hotel, Imperial, Lifestyle, Luxury, Music, Piano.